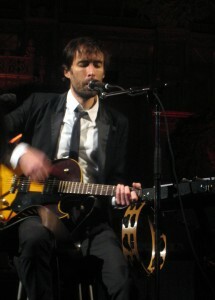 Looking increasingly scruffier as the week goes on, Andrew Bird also seems to be getting more and more comfortable with this installment of church shows. Sure, he’s still as twitchy and, well, neurotic as always, but he was a bit more relaxed on night three. I wonder what night four will bring…? I think you would have known #1 and guessed at #2 jokingly. Still waiting for the grand finale!!!! After I saw the setlist, I was like, crap, I KNEW I had heard that first one before.